2SickYoYos is an American yo-yo company started by Joey Serrano. 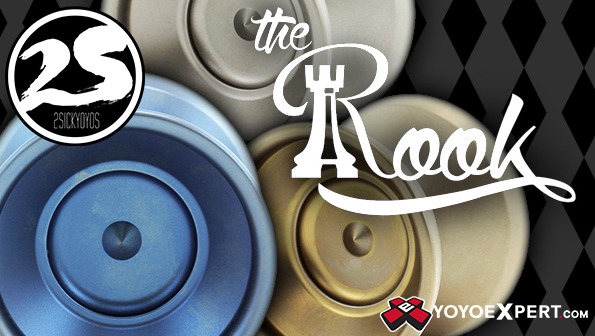 Joey has been yo-yoing for a long time and when he decided to pursue his dream and start a yo-yo company, he brought his idea to the amazing members of the YoYoExpert Forums for advice. With their support and advice he was able to successfully release his first model (The Gambit) and now we are proud to carry his latest TITANIUM yo-yo! The ROOK! The American made Rook is a full-sized Titanium design that really impressed us! 2SickYoyos has been working on and prototyping for a while, and once you throw it you can immediately feel all the work that's gone into this new design. Built for competition level performance, but designed with the recreational player in mind - The Rook has a super comfortable feel in the hand and on the string. It has an impressively powerful spin off the throw and a stability that resists tilt really well through any combo. It moves fast, has excellent spin time, and gives you everything you're looking for in a new titanium yo-yo and then some! Note: Due to the unique finish of the Blasted Dark Gray color, it is recommended to keep a close eye on string wear during play. The rough finish may cause the string to wear at a faster rate than normal.